At any other time this venture would be pleasurable. And fun. Although, as it turns out, both these qualities are present in some degree. Which is just as well given that my previous post was a real ‘downer’ coming hard on the heels of positive, uplifting thoughts and resolutions. Rob’s funeral is arranged for New Year’s Eve – his wife and children want to draw a line under 2012 and start 2013 afresh. Getting family and friends to the middle of France in the middle of the Christmas/New Year holiday proves a logistical nightmare. There is a saying in France that “Christmas is for Children, New Year is for adults”. So while shops and services are back to normal on December 26th, this is short-lived and things wind down again as New Year approaches. Hotels close, Gites close, Resturants close and Annie spends half a day on the phone to various places within a 30-mile radius of Rob’s house seeking accommodation. Eventually she finds a B&B in the back of beyond, which will accommodate us, her Mum, two sisters and a niece as well as her son Chris and wife Em. It’s a large, rambling place dating in part from the 14th Century. It’s the sort of place you might see on a makeover television programme – it has all the right ingredients; hopes and dreams as the prospective owners visualize what they might do with the place. Then drama and despair as the walls collapse in a pile of rubble shortly after they sign on the dotted line. As with all TV makeovers however, it all comes right in the end; walls are rebuilt, a new roof fitted and we’re able to sit down in relative comfort with a cup of tea after a 10-hour drive from Calais. As well as two children, the owners share their home with a pair of Harris hawks, a European Eagle Owl, an enormous ram called Timmy and two fat dogs. There are other animals and birds around – chickens, ducks and sheep – but it’s the birds of prey and the ram that really make you sit up and take notice. The hawks sit on their perches making unfriendly noises; Timmy – wagging his tail and nuzzling his head for a pat, clearly thinks he’s a dog – although I can’t see him fetching a stick. And with a couple of attentive ewes around, he has more important duties – this is a working ‘not quite’ farm with little room for sentiment. Their pig has gone to the sausage-maker in the sky and by the time I get round to I writing this, a couple of their lambs will no longer be with us. When the owner asks after breakfast if we’d like to feed the animals, we readily agree, not realising he means to each other. 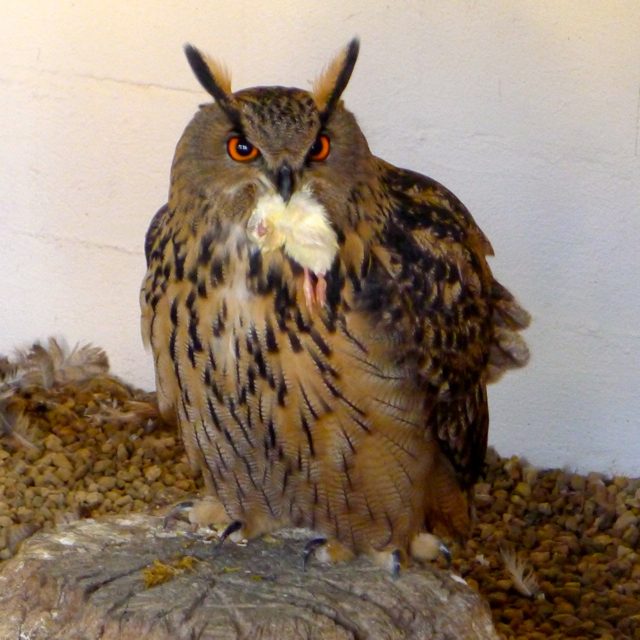 My ‘townie’ sensibilities kick in when he carries a box of day-old chicks down to the Eagle Owl’s enclosure. I pass on the invitation to give the bird, magnificent though she is, her breakfast. Of all the animals it’s the two fat dogs that fascinate me the most. Apart from their size (or rather, girth) I’ve never seen anything quite like them before. A bit like a spaniel, but with a pointy face. Or rather, in the case of these two, a small hairy beer barrel with a pointy face. The breed is Brittany (named for that part of the country) and their purpose is to retrieve game brought down by birds of prey. The dogs are affectionate and good-natured but if asked to retrieve game would probably roll over and laugh. Or whatever the dog equivalent is. And then struggle to get back up again. The B&B is comfortable, the food good, but the owners have clearly not learned portion control. The breakfast table heaves with baguettes, croissants, brioche and toast as well as various cereals. Dinner too, would feed twice our number and I’m a little embarrassed about leaving so much. I mention this to the owner, but he just shrugs and explains that the leftovers go to the animals. All the animals? Yes. What – including these two? And suddenly it hits me; perhaps two fat dogs – whilst sounding a bit like an obscure bingo call – is simply the result of trying to please the guests a bit too much. We stay four days in all. It’s clear, on the way back home in the car, that this unexpected encounter with nature (red in tooth and claw) has provided sufficient diversion, or rather balance, to our primary reason for being here. Chris and Em talk about going back for a holiday. And under other circumstances I can see why. It stopped us getting too maudlin – there were plenty of laughs among the tears. Rob would have enjoyed it. Perhaps he did.